Iris was commissioned by SOFTlab for Signal Festival in Prague. The SIGNAL Festival of Lights is the largest cultural event in the Czech Republic, whose unique integration of art, city space, and modern technology has drawn over 2 millions attendees to Prague in the five years of its existence. The festival brings visually attractive works together with complex installations of international quality. Its concept allows it to appeal both to professionals and the lay public. With its support of new works of art, the SIGNAL Festival has become a respected platform on an international scale and a sought-after venue for introducing the newest projects of the field. Among them stands Iris, an installation of an interactive array of responsive mirrors and LEDs that creates a circular enclosure within the Mirror Chapel.In art we meet with various paintings, sculptures and other works of art. Thanks to its character, however, Iris presents a completely different piece of work since here it is the space itself within which the installation is situated that is believed to be the artistic medium. The mirrors rotate in response to the movement of people in the circular space, while the LEDs respond to ambient sound. The circular array can be thought of as a lens that reflects both light and sound. The installation is meant to blend or confuse light and sound through its capacity to focus and unfocus these mediums. As the mirrors rotate, they open the perimeter allowing not only direct views of the Mirror Chapel, but also creating a Mise en abyme, mixing the surrounding chapel, viewers, and light in a vertically fragmented, recursive, and panoramic image. The installation mingles the light and the sound in such a natural way that their mutual boundaries fade away. The rotating surfaces of the mirrors reflect the exceptional architecture of the Mirror Chapel, faces of the surrounding audience as well as the flash of light, which gives birth to a unique, vertically disintegrated panoramic scene. Both the intricate nature of the Mirror Chapel’s architecture and its use as a classical concert hall drive the design of the installation. A mirrored object in the round reflects the ornate surroundings externally while reflecting the viewer infinitely on the interior of the circular enclosure. This reflective enclosure is disrupted as people approach for a closer look. In this way, it is curiosity and sound that activate the installation. A closer look has the potential to produce a delightful bewilderment as the exterior leaks in while space and sound become multiplied in unexpected ways. In that sense, Iris is not an object, image, or artifact on its own, but relies on the existing space as the medium. As it bends, multiplies, and conflates light and sound it calls into question the lenses (both mechanical and cultural) that limit or expand our spatial experiences. The installation is made of a grid of 40 mirrored panels that each rotate individually. An array of depth cameras above track people as they move around the installation. Using a weighted average of the various people being tracked the mirrors rotate to face the nearest person. Individually addressable LEDs along the sides of the mirrored panels respond to the ambient sound in the space around the installation. Each mirror is actuated by a ZEUS 14bit SMSV3.0. 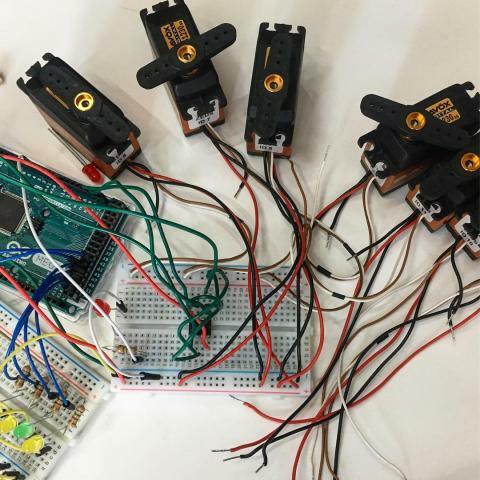 The ZEUS servos made by ZEROONE are powered by SAVOX technology. The gears and the motor of this specific servo are manufactured by SAVOX and their torque rating is 500ozin (36kgcm) @ 6V. The equipped coreless motor can operate also upto 7.4Volts.